Brian and I started running about a year and a half ago. It was right after I turned 30 and started getting a spout of health problems that I realized I want to be moving my whole life so I need to do something about it now. I started running in the afternoons when Brian would get home from work (wasn't much of a morning person). Brian would run at the gym at work in the morning. This worked great for a while and we were feeling much better. Then Brian one day said he wanted to run a marathon. I thought he was crazy. I mean, really we were only running about three miles at the most, and most of his mileage was on the dreadmill, oh I mean treadmill. One day Brian decided to run outside. He got to the bridge, about a mile away, touched it and hobbled on home. That is when he decided never to run inside again. From then on he was determined and each week he did a mile more. I couldn't believe when he actually hit four miles. I was getting a little jealous. I still had NO plans whatsoever to run a race though. Then last February while I was running, I tore my achilles tendon. I was upset because I had finally hit the four mile mark and started feeling good about my runs. After taking six weeks off, I bought some new shoes and started again. I still had no intentions of running a race. But, I couldn't let Brian pass me right? So, then I started upping my mileage. I hit four miles and thought I was on top of the world!! By then Brian had hit about nine. So on it went like this until Brian actually DID sign up for the Baltimore Marathon! I couldn't believe it. I still thought he had no idea what he was getting into. And no, I still had no intentions for myself. I was just trying to be healthy here, not to try and run a race. But Brian talked and talked and slowly I started thinking about it. Then, about three months before the race, I realized I was healthy and feeling good and probably in the best shape I have been in since high school, I decided I better run the half-marathon while I can. On one night when I was feeling a little more brave, I signed up. So now we are two days past our goal. 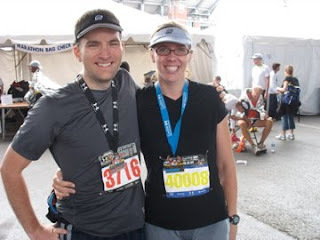 And yes, Brian finished the marathon and I actually finished the half-marathon. In the middle of it I really wondered why I was doing this to myself and what had made me think I was in shape enough to finish 13 miles, but I kept trudging through and amazingly I did. 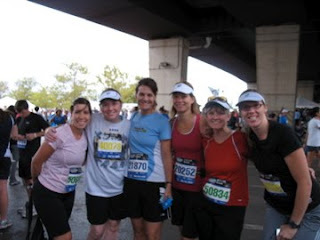 Thanks to my good running buddies, I probably wouldn't have done it. I needed that extra little motivation to keep me going when those hills seemed to be never ending. Brian was amazing. He didn't get his goal time, but he finished even when he hit mile 16 and thought he couldn't go a step more. What surprises me the most though is that he is already talking about more.... "what can I do to get in better shape?" etc. etc. I think I've had enough for now. I'm going to hang my medal up somewhere. Tah tah for now running... until Wednesday.